Medals won by Manchester City's most-decorated player will go under the hammer again on Tuesday. Only last year, Mike Doyle sold off his 1968 league title winner's medal, an FA Cup winner's medal from 1969, medals for the League Cup triumphs of 1970 and 1976, and the European Cup Winners Cup in 1970. Now some of the collection will be going on the market again. "They'd been stuck in the safe for goodness knows how long," said Doyle, now 55 and with four grandchildren. "The cost of getting them out of the safe and insuring them would have been ridiculous, so I got in touch with Christie's, thinking that someone else could get some enjoyment out of them. "I'm still down in the record books for winning all these things." An anonymous vendor now wants to sell Doyle's 1969 FA Cup winner's medal, which is expected to fetch £6,500 at Christie's in London, as well as a division two championship-winning medal from 1966, which may go for £1,000. "The market for football memorabilia has grown steadily over the last 10 or 12 years," said Christie's. "Good luck to them," he said. 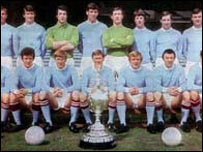 Doyle joined City from Stockport Boys in 1962 and no-one since has won more medals. He made his name as a tough-tackling defender and was loved by fans for his oft-repeated dislike, to put it mildly, of Manchester United. Despite this, he nearly joined the Reds at the end of his City career before moving on to Stoke and then Bolton, earning four England caps along the way. City's website states: "Over the years, Doyle was a tower of strength at the back, helping himself and the club to promotion to division one, then the league title itself. "Since Mike left City, no player has been able to match the honours he won. "He was a determined and committed player the fans loved for his fighting spirit and never-say-die attitude. "He also endeared himself to the fans with outbursts about United - a team he loathed."